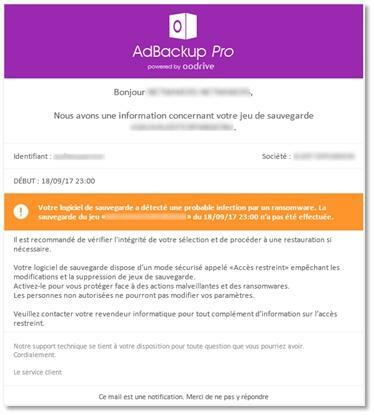 The AdBackup solution allows VSEs and SMEs to protect themselves against the risks of computer disasters, thefts, water damage and fires by safeguarding their critical data to highly secure French hosting centers. The operation of AdBackup is very simple and that is why it is so well adopted by all types of companies. The first subscription to less than 10 € per month allows you to download a small software on your computer or server. Note that this software is compatible with all operating systems: Windows, Mac OS X and Linux. The software does not require training: simply select the directories to be saved as well as the ones to exclude. You can also exclude file types such as .xml, .zip, .exe files. The next step is to configure the backup periodicity. It is possible to make manual backups but we strongly advise you to make automatic backups. Finally, set your notifications to be notified of the backup status each time it is performed. In case of malfunction you will be immediately informed of the failure, allowing you to react. Backup locally or in the Cloud? You must make a choice on the type of backup you are considering from the start. It is actually possible to save files and folders locally on an external hard drive. However, this option is not the one that offers the best protection: hardware failure, disaster or theft ... the local backup contains a lot of risks. On the other hand, backup in the Cloud (on Oodrive data centers) offers a guarantee of access to its data all the time: duplicated, encrypted, redundant data. In addition, Oodrive is responsible for the maintenance of its servers. All your hardware issues disappear with the cloud. If you have any concerns about the confidentiality of your data, please note that Oodrive is subject to strict conditions for which it has many certifications (ISO 27001 for example). Oodrive data centers are located in France in the Paris region. Intuitive and easy to use, AdBackup allows companies to back up their critical data in a completely secure way. In the event of a computer disaster, you can retrieve all your data in a few clicks. Simply install the AdBackup software on your workstation or server and configure it to automate the backup process: choice of files, folders, backup frequency, number of versions, and so on. Your data is automatically backed up to highly secure data centers in France via the Internet. Data encryption and geographic redundancy provide the highest level of security and privacy for your information. Oodrive is a publisher that has been very serious for years. It is recognized for its many certifications but also for its technological advances like the delta-block backup that frees up your bandwidth. Unlike US solutions under the Patriot Act, Oodrive offers the highest level of privacy and absolute security. Automatic file exclusion Exclusion of files based on their size, sharing settings, etc.